Mold is a naturally occurring effect of New Jersey’s warm, humid climate during the spring, summer, and early fall. Mold spores are part of our environment; they continually waft through the air indoors and outside. Mold problems start when these spores come into contact with water, moisture, or high humidity and attach to the surface of organic matter that they eat, or more accurately, dissolve. In the right environment of air, water, and food, mold spores begin to multiply and form colonies inside buildings. Mold formation, left untreated, causes property damage and health problems for its occupants. Schools are especially problematic with mold growth because classrooms are relatively small areas with limited airflow where children and teachers spend hours at a time breathing in the same air. When building materials or furnishings are damp for more than 48 hours, mold will likely start to grow. Schools can experience water damage in a variety of ways -- roof or plumbing leaks, floods, and poor drainage of water runoff or landscape irrigation, just to name a few. Schools that are damp support mold growth and students and staff, particularly those with allergies or respiratory problems, may develop adverse health effects. Mold problems have recently plagued schools across New Jersey. In 2014, Brick, NJ Drum Point Elementary School was dealt with mold issues. According to an August 2012 CBS local news article “Mold Disaster Causes Chaos In Manchester, NJ School District,” mold forced 700 students out of their middle school after mold was found inside several first-floor classrooms and the cafe. The result was that the middle school had to be closed for months. Mold problems have occurred in numerous districts throughout the state. One superintendent in Atlantic County attributed the problem to high temperatures and humidity with an unoccupied building. With the HVAC systems not turned on as often, not enough moisture was removed laying the groundwork for mold formation. Students and teachers can become sick from mold in schools. A national survey of school nurses found that 40% knew children and staff adversely affected to indoor pollutants. There is no generally accepted standard for how much mold or what types of mold can grow inside a room before it becomes unsafe. Because sensitivity levels can vary widely from person to person, any type of mold at any level may be potentially harmful. Some types of mold emit toxins that can elicit more severe responses. For example, Aspergillus and Stachybotrys have forced the closure of schools throughout the country and have been linked to lung and respiratory infections. 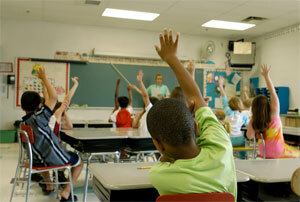 Mold Solutions by Cowleys can fix mold problems in your school or school district. We work in Cherry Hill, Woodbridge, Toms River, Bridgewater, Princeton Junction, Middletown, Old Bridge, Piscataway, New Brunswick, Lakewood and nearby. Contact us for a price estimate today at no obligation to you!